Sit on the GROUND not the hound! Yep…it needs to be said! 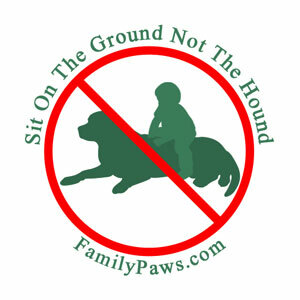 Many people laugh when they see my stickers….sit on the ground not the hound. This is NO joke. Some think it is so obvious it need not be said. 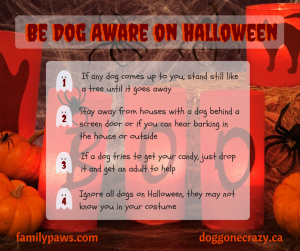 Sadly many people think this is ok. Or they know it is not a good idea but if the dog does not growl or bite…then he likes it. We have a great deal of educating about being Dog Aware™. Intelligent and caring parents make the mistake of expecting a dog to tolerate many things their child does. What saddens me is the heartbreaking phone calls when a dog’s tolerance runs out. When the subtle signals dogs use naturally to indicate stress, conflict or need for space, do not work then it is likely the dog will progress to a growl or bite. Dogs are predictable and with more education and families become Dog Aware™ I know we can help parents make better choices to support life long relationships with dogs. Headlines I don’t usually like to comment and show things I DON”T want done. I prefer to post things that are nice examples. This however concerned me and I felt was a very good teachable moment. 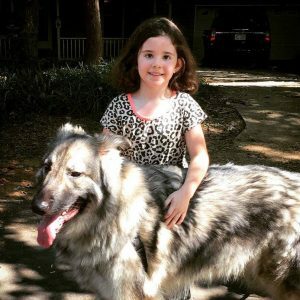 Princess Charlotte make friends with HUGE dog and bounces on him. One articles says jumps on him like a trampoline. Let’s look at just a couple of things that could be very stressful for Charlotte’s new friend Moose. I know I would NOT enjoy a child running over to me and bounding on my back if I were resting. Not my own child and especially not an unfamiliar child. Why is it we believe a dog should tolerate this? “What a good dog.” often is heard in these situations. This comment indicates we KNOW this is not something acceptable. Why do it? I compare this to when I was pregnant and the world thought my extended belly was a free for all to touch. UM NO! We all have spatial needs and boundaries and it is really important for us to teach our children this about animals too. We don’t want our children rushing up to strangers and hugging them but yet it is “ok” for them to do this to strange dogs? Think about it! this is not fair or comfortable and the bottom line is if a dog does vocalize or complain he is likely to be punished or put down. We really need to shift our expectations. Dogs do not enjoy bouncing weight on their backs and even if they “tolerate” it one time this definitely does not mean they will continue to do so. The likelihood actually is that they will begin to dread and anticipate small children as painful and intrusive. This can be a huge problem for the next child the dog encounters. We must create mutually comfortable interactions when it comes to encounters with young children and dogs. Not all kids want to touch dogs and not all dogs want to be touched. No dog enjoys being sat on. Another concern by allowing this behavior is that a child may think Mommy and Daddy love when I sit on dogs. Pictures and videos are taken…. everyone laughs. This is very reinforcing for most toddlers and they will repeat this with not only that dog but other dogs too. What I would like to suggest to help families tempted by setting up these “cute” situations is to become familiar with subtle signals dogs offer indicating stress or a need for space. Dog Aware parents learn about body language that is seen WAY before a grumble or snap. Most likely in all of these riding dog encounters the dog is offering signals but they are not being received by the trusted adult because they are unaware of them. Here are just a couple. Having toddlers and dogs together is a full time job. It can be hard especially if you do not know what to look for. 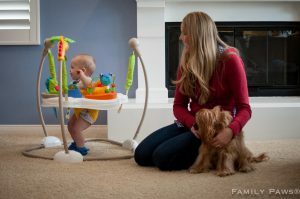 Family Paws Parent Educators offer ongoing support and resources dedicated to dog and baby/toddler dynamics. Don’t wait until you NEED us…..call us when things are going well so we can help them go GREAT! If you have questions or are interested in learning and becoming a Dog Aware parent we invite you to reach out to us on our hotline 877 247-3407 or find one of our licensed Family Paws Parent Educators near you! Become Dog Aware™and supervise with care! We all have heard the advice SUPERVISE CHILDREN AROUND DOGS! Ok….so what does this really mean? Is it that simple? I thought it was until I become Dog Aware™. Now I approach supervising differently! Free touch of babies & dogs is not comfortable for dogs. Hugging and leaning on dogs is uncomfortable. I was missing a key part of supervision! I was not Dog Aware™!!!!! Dog Aware™ parents continue learning and stay curious about the behavior of their family dogs. At the time of these photos I felt I knew enough about dogs and you could not have told me differently! I grew up with dogs, showed dogs and I knew dogs. I was WRONG! What I knew was lacking. How unfair of me to think dogs are that simple and that I knew all I needed to know!? Do we ever know everything???? I really had a LOT to learn. Once I realized this I got excited! Imagine the relationship my kids and dogs could have if I knew more! So, yes I was supervising my kids with our dogs but with no real knowledge of what I was looking at. I had lived with dogs but never PARENTED WITH DOGS! 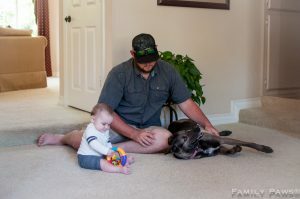 This was new and I needed to be open to learning to help build and strengthen the bond between my children and our dogs. Although I grew up with many dogs I had never parented a child with dogs. I am still learning every day as my kids grow into young adults. Being a dog family with children means being aware and respecting comfort levels of the dogs that are in the home. I love when parents are open minded and curious about the subtle signals their dogs use to communicate. Dog Aware parents stay curious and continue learning to build and strengthen the bond between all family members. Are you ready to increase your Dog Aware™skills? Are you curious about how your dog reacts or responds in different situations? 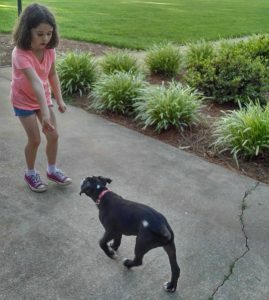 Are you interested in strengthening the bond between your child and dog? Believe me, you are in the right place. I am so excited to share some of what our family has learned over the years! We continue to learn every day from our dogs. I love being curious and open to seeing things differently. I would love your questions and photos during the month of May to discuss Dog Aware™ How are you Dog Aware™?? Leave us a comment! We want to hear from you! Carry a doll? Should we practice? Great question! 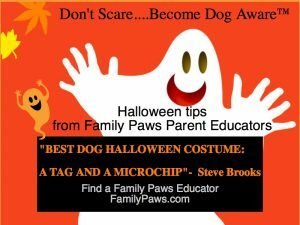 This is a very common recommendation and many families feel very silly or uncomfortable with this type of “role play.” Family Paws Parent Education (FPPE) does recommend activities that help parents to learn more about their dog’s responses. We suggest families practice what they want their dog to do in a variety of situations. Here is how and why we recommend this activity. Suggestions on how to practice. You can either use a weighted baby doll or use a pillowcase with 5-10 lbs of bagged rice or water bottles. We like it to be baby weight and a bit floppy. This may seem silly but the idea is to role play different situations as you carry your pretend baby and practice desired behavior with your dog. Here are some things you can learn from this activity. Will your dog be interested in your “pretend baby?” Jumping? Pawing? Ignoring? Does he think it is playtime? A game? Does he grab at your pretend baby? Does lifting up your “baby” from a carseat or blanket on the floor cause interest or excitement? How does your dog respond when you talk to the baby in your arms? Does passing your “baby” to another person cause interest or excitement for your dog? Does your dog follow verbal cues while you are sitting? Leaning back on the couch? Talking to baby? For your dog, this is a very different picture than you asking them to do something while you are standing and looking at them. For example, most dogs will need to learn that “sit” while you are lying back on the couch holding something is the same as “sit” when you are standing up and holding a treat. These are just some of the questions that this activity can help you answer as you prepare with your dog for baby. Learning how your dog responds to you in this type of situation allows you to problem solve and practice ahead of time. It is of course important to remember that your dog will likely be more excited or interested in your real baby because babies move, make sounds, and smell different than a pillowcase with water bottles. It is also important to remember that YOU also may respond differently when you hold your newborn. This is just the very basic steps of this activity. 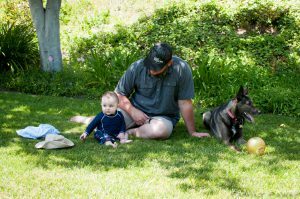 There are many games and activities to help families with dogs make this transition into parenthood smoother. Contact a Family Paws Parent Educator to begin preparing with your pup for life with baby today! Preparing ahead and practicing calm and consistent behaviors before your real baby arrives can save you and your dog from a great deal of stress and frustration moving forward. Headline reads- Adorable dog tucks baby in to sleep. The gentle nudging of the blanket to cover a newborn can be heartwarming but also misleading. It is often hard for new parents to remember that their family dog is still a DOG. They are not relating to their baby as a human sibling. This may sound like a simple and obvious point but for many who really want to see the harmony between the new baby and dog sometimes these lines can be blurred. Dogs do not do this with their alive puppiies. They do this with novel things they want to stash for later or to cover up scent of. Please always remember that your dog is a DOG and will always act and behave as a dog no matter how good of a dog he is! Here are a couple of examples of dogs displaying this behavior. What do you think?